Will you have a post on how the global OLR is measured? I can imagine the difficulty in measuring the global average OLR. Its accuracy is likely to be questionable, just as the average global temperatures are. The claimed changes in global average temperature is a very small percent of absolute (degrees K) temperature. With OLR, the accuracy capability of the global measuring method may be well outside the small percentage change, if any. Probably the next post will touch on that. Love the site, deserves more traffic. I wonder if I could ask you, Dr. Phillips, to help clarify something for me. I recently read Dr. Hansen’s book, in which he argues that we should look not to models to see what the earth will be like if we continue on the present path, but at the climate record, to other times when we had similar CO2 levels. What I am wondering is, how do we associate past warming with past CO2 levels, given the complex relationship between the two? Your comment got trapped in the spam queue because it breached a point of etiquette. I resurrected it with a minor edit. I’ll take a look at your question shortly, but I’m not “Dr. Phillips”..
As to your question – it seems like a massively complex problem – which you also allude to. Climate effects are inter-related and non-linear. There’s also the argument “CO2 levels have been much higher in times of similar temperatures, so there is nothing to worry about..” – I haven’t dug into that to find out even how strong the evidence is – because many other conditions would have been different. We have had times of higher overall temperatures that have been more moderated than present day distributions – lower temperatures in the tropics and higher temperatures at the poles than present. But circumstances were much different – continents in different locations and who knows what else. The Ghosts of Climates Past are a “gift that keeps on giving” for both sides of the discussion. I do plan to cover some aspects of the more recent past – like the last million years. Forgive my ignorance; but would out going radiation not be less until an equilibrium was reached? You are right. I thought that’s what I said. Increase CO2, less outgoing radiation.. finally a new equilibrium at higher temperatures. I might have labored the point so much that the key point was obscured..
I’m just another reader of the blog like you, and have no PhD. Considering the fluency and authority with which you review the science, you can understand my confusion. Thanks for your response. on February 22, 2010 at 9:25 pm | Reply Tim W.
Of course, there’s no latency, (except of interest to people who love quantum mechanics) between absorption and re-radiation. Now that energy increases the temperature of that layer. So the layer radiates energy out. But instantaneously there won’t be any temperature increase. Why not? Because of the specific heat capacity of the oceans, the atmosphere and so on. Like turning the heat on the stove, the water takes time to heat up. More energy comes into the system than out so the whole system has to heat up – where the heat ends up depends completely on the characteristics of that system, a very complex problem. But simplifying it down we end up with an increased temperature at the surface. Eventually the temperature increase at the surface is high enough that the “lost” 0.5W/m^2 is now made up for and energy equilibrium is now re-established. “All things being equal” of course. on February 22, 2010 at 10:02 pm | Reply Tim W.
I am a bit dense so bear with me. If the earth is at equilibrium and radiating 265 W/m^2 at the TOA and we add a bit of CO2, the added CO2 absorbs energy (say 1 W/m^2). Now that 1 W/m^2 is re-emmitted with 0,5 going down (as a temperature increase) and the other 0.5 going up. Why isn’t the emission then 265.5 W/m^2 at the TOA? on February 22, 2010 at 10:07 pm | Reply Tim W.
Wouldn’t the main reason you don’t see OLR increase is that, from space, you are (mostly) seeing the radiation associated with the “top” of the troposphere? Since that temperature isn’t expected to change (much), you wouldn’t expect the OLR to increase…. This post really tries to cover the basic idea of energy balance. Once we move deeper into the subject it all gets more complicated. Like “how does the equilibrium get restored”? There’s more in Part Three – with the concept of where the atmosphere radiates from. Say you assume the U.S.Standard Atmosphere, with tropopause starting at a little over 11 km and stratosphere maybe 20 km. (a) At what altitude does the top of the atmosphere start? (b) What is the physical definition of TOA? Perhaps when collision frequency is low enough that one can no longer assume local thermodynamic equilibrium? In the context of this article, it is just the limit of outgoing longwave radiation as you move further away from the earth. TOA is where OLR (outgoing longwave radiation) doesn’t increase any more, and where DLR (downward longwave radiation) is zero. Looking down from between 30 and 40 km, OLR increases about 1 W/m2. Above that the changes are in the tenths of a W/m2 for a change of 10 km. The highest this program allows is 70 km. It reports DLR for looking up from 60 km as 0.17 W/m2. My assumption is that the TOA is the altitude above which nothing changes significantly – but “significantly” means different things in different situations. 30 km (10.9 mb) is above 99% of the atmosphere. But the ultimate answer you have to get for total outward flux in standard atmosphere is about 239 watts/square meter because that is what you get if you turn off the greenhouse effect., assume equilibrium with the sun’s input, put in cloud albedo and then deduce an earth surface temperature of 255 degrees K.
On the other hand, if you set U. Chicago Modtran with default settings except use a U.S. Standard atmosphere rather than a tropical atmosphere,, it calculates upward flux at 70 km of 260 watts per meter squared. This is entirely too large? The US Standard atmosphere is just one “representative” atmosphere. As far as I know, it wasn’t designed to produce the global annually averaged OLR. And we could say e) the absorbing characteristics of each greenhouse gas across wavelengths, but e) is effectively a fixed material property, while a-d are factors that change around the earth and from day to day. If you look at “clear sky” OLR (globally annually averaged) you get a value around 270 W/m2 (I’m going from memory because it isn’t critical to understanding the various effects), while the “all sky” (clear sky + cloudy sky) value is 239 W/m2. Just to add to that, the OLR varies significantly across the earth’s surface and by season. You can see the month by month results for the whole year at Understanding Atmospheric Radiation and the “Greenhouse” Effect – Part One. Douglas: Our host has provided you with a better reply to your comment than I could have. I’ll simply add that most atmospheric profiles in MODTRAN also don’t calculate exactly a 3.7 W/m2 reduction in OLR when CO2 is doubled for exactly the same reason. I wish MODTRAN allowed one to choose a planetary average atmospheric profile that consisted of an appropriately weighted average of radiation transfer through the atmospheric profiles you can select. Is there some way I can construct a graph of my own related to this topic and either post it in Science of Doom or send it to Science of Doom for further discussion? Douglas, you can email it to me and I’ll put it up. scienceofdoom you know what goes here gmail.com. I think I have found something interesting between your recent reply to my question and something I already found out. I will send you two attachments, but perhaps there would be something better to do than post these. So lets exchange a couple more e mails before posting. See attachment 1 and 2. Attachment 1 is of ModtranChicago set for only CO2 as greenhouse gas looking down from 20 km. The settings are shown in the attachment. I wanted to check something out and partially digitized my graph with UnScanIT in point by point mode. The way I did this was to construct my own Planck distribution for the regions of the curve above and below the ditch shaped minimum then splice these into the digitized result. There is a little scatter. The curve so shown is in attachment two. You will notice that my curve extends from 5 wn to 2000 wn, whereas the ModtranChicago curve goes from about 100 wn to 1500 wn. I integrated my curve using the trapezoid method and got 346 watts/square meter, as opposed to the result ModtranChicago gave of 322 watts/ square meter. Could it be that this significant error is because ModtranChicago really cuts off below 100 wn and above 1500 wn? I checked this out. I then used the button on the ModtranChicago output that accesses the”:Raw Model Output” of the computer run. Here is a quote from an on line pamphlet I have been writing which hopes to translate the nomenclature and point of view of atmospheric science into a form intelligible for solid state physicists. *Upon examination of the âRaw Model Outputâ feature of Modran, it became evident that the Modtran integration only extends to 1500 wn. **If I repeat my integration under the orange curve in Fig. 9, but stop at 1500 wn the output flux obtained is then 329 watts/meter squared. The Modtran âRaw Model Outputâ shows that the Modtran integration is started at a lowest frequency of 100 wn, instead of 5 wn. If I then integrate from 100 wn to 1500 wn, as does Modtran, the output flux I obtain is 327 watts/meter squared, compared with the Modtran output of 322 watts/meter squared. This is a difference of less than 2 percent, which is probably all one can expect considering some error in the *point by point digitizing of the data shown in Fig. 7. My conclusion is, therefore: The Modtran output was low by about 20 watts/meter squared! I checked this by looking at the “Blackbody radiator” feature of SpectralCalc. If I integrate between 1500 wn and 2000 wn using SpectralCalc for 288 deg K and emissivity one, I get a spectral radiance of 5.622 watts per square meter per steradian, which multiplied by pi steradians yields 18 watts per meter squared. Using SpectralCalc between 5 wn and 100 wn adds two more watts per square meter to make 20 watts per square meter. The SpectralCalc result is independent of any digitizing error on my part. There is a Journal of American Physics which publishes material that is useful for teaching about various physics topics. Would you be interested in co authoring this with me? I would write initial version and pay for putting it into LATEX. As far as posting those figures, here is my fear. There are people who would want to run with this with the ridiculous point of view that there is a small error in David Archer’s wonderful program and therefore Global Warming is a Hoax. Rather the point of view should be that this program is a marvelous teaching tool which we are now improving so that it even gets the clear sky OLR right. I didn’t get any attachments. I wouldn’t worry. Everything out in the open and subject to scrutiny is the best medicine. That is what this blog tries to do. From your first paragraph, and from Frank’s comment it seems you have solved the question on the discrepancy of upwards flux higher in the atmosphere. As for the question about the upwards flux from the surface, I don’t know the limits of the Modtran program, I have barely played with it at all. I did write a Matlab program which used line by line calculations, using the HITRAN database, for various “greenhouse” gases and was able to reproduce a lot of results found in textbooks and papers. You can see these results (and the code) in the series Visualizing Atmospheric Radiation. The results are never an exact match, for all kinds of technical reasons – the temperature profile, which GHGs are used, whether better line shapes (Voigt vs Lorenz) are used for the stratosphere/upper troposphere, what surface emissivity is used, what water vapor continuum formula is used.. it’s a long list and this is why there are periodic inter-comparisons between GCMs and LBL (“line by line”) calculations. For example, Radiative forcing by well-mixed greenhouse gases: Estimates from climate models in the IPCC AR4,WD Collins et al (2006). There is a Journal of American Physics which publishes material that is useful for teaching about various physics topics. Would you be interested in co authoring this with me? Well, that is very kind offer, but unfortunately I don’t have a lot of spare time generally – as you can see from the complete lack of articles I have written in some time. I would like to write more and have been reading up, but I think my “climate time” will need to go into this blog if it goes anywhere. Thank you so much, Science! Looking at the words I sent you, even if the graphs were lost in cyberspace, I see something that makes this better. The ModtranChicago 260 watts per meter squared plus 20 watts per meter squared correction actually gives 280 watts per meter squared. Multiply this by 0.97 which is my “effective emissivity” at surface, gives 271.6 watts per meter squared, very close to the “clear sky emissivity” number that you remembered. So the refinement in my above paragraph makes the corrected ModtranChicago results looking down from zero altitude consistent with the corrected ModtranChicago results looking down from 70 km and do give an OLR at 70 km of about 270 watts per meter squared. Now my next step is to dig into the literature to find a reference that gives the “Clear Sky OLR” so as to verify the approximately 270 watts per squared OLR as seen from a satellite, which is a number you recalled from somewhere. What’s your goal? Or, asked another way, what is the problem you are try to solve? Calculating the clear sky OLR from one surface (with one temperature and one emissivity) with one atmospheric temperature profile and one GHG concentration (for each of water vapor, CO2, CH4, N2O, O3) is one problem. Calculating the average (global annual) clear sky OLR is another problem – which relies on either the measurements from CERES, or on a “reanalysis” where you have the above list of parameters across the globe, across the year and are able to do the calculation and produce an average. I found a cool reference for this. X. Huang, et al, in Journal of Climate, Vol 26, p. 478, 2012. Their table three. Entitled “Near Global Annual Mean Band Fluxes and OLR Derived From collocated AIRES and CERES Measurements…. (and other stuff as well. )” Bottom Line…..They use baseline AIRES value of 273.74 watts / meter squared and then do plus various somethings or other on order of ~ +3 watts per meter squared — – 2 watts per meter squared trying to see how the various satellites and satellite corrections do or do not agree. But for my purposes I think all I need is that the answer is indeed something like 274 watts per meter squared. ( Previously I had corresponded with David Archer on another Modtran issue I found….if you compute the CO2 climate sensitivity from Modtran versus altitude the plot has sharp little discontinuities that look like round off errors to me.) He pointed out that the basic program is left over from the days that the funding was strictly to design better heat seeking missiles. But if I curve fit the plot I get something that makes sense and the discontinuities do not really change the over all picture. So by a heat seeking missile program that is a great teaching tool, something around 274 watts per meter squared is fine and all one should expect..
It’s a technical paper looking at the differences between different “editions” of the data from two different satellites – the kind of stuff that climate scientists do routinely (as far as I can tell from reading 1000+ papers). On a somewhat different topic I noticed the comment of Robert above. Robert, there is an on line lecture by one Richard Alley of Penn State (Bjerknes Lecture) that is still available on the web. One takeaway I got from this….if you go back past the ice ages, say past 800,000 years….then it is not as accurate to determine correlation between CO2 levels and temperature.. i.e. nothing like an ice core for doing that. For geologic times millions of years ago the experimental climate folks have to use other “proxies” to investigate the relationship between CO2 and temperature. However, the most modern work seems to show this correlation even for geologic times well before the ice age cycles. “Add some CO2 – and, all other things being equal, or weasel words to that effect, there will be more absorption of longwave radiation in the atmosphere, and more re-radiation back down to the surface – so clearly, less OLR. I´m not new to this, but “what” is exactly my response after my jaw broke when it dropped to the floor. You write that co2 cause less radiation to be emitted from the top of the atmosphere, which means that it absorbs more from dropping in temperature, and that this is a cause of rising temperature in the surface mass. Where in your textbooks do you find an explanation showing how a cold gas that decrease its emitted intensity when in contact with a surface that is hotter, when surrounded by 3 Kelvin vacuum, is cause of a rising temperature? You can start by trying to find an example without the vacuum, since it is a rather special situation. You mistake this situation for what happens when a hot surface warming a cold fluid increase in temperature and the emitted intensity gets higher. Then there is a delay as the energy distributes through the volume. There can not be a rising temperature from the gas dropping in temperature. Why is it so hard to keep warm and cold separate? If I take any 5-year old and take them out in the sun, and first spray him/her with a mist of water, then pour a bucket of water over the head, then put some dry ice in the kids hand, and ask them which is hot, the sun or the dry ice and water, all of them can give the right answer. What is your problem? The issue here is about how much LWR penetrates the atmosphere and leaves the earth system into space. Nothing to do with hot vs cold bodies. Most of the LWR emitted from the earth to space originates in the atmosphere, not from the surface. Emission is non-linearly proportional to temperature. That’s why it’s important that the temperature in the troposphere declines with altitude. This is a question that can be answered when you are working with an idealized atmosphere. And you can give good answers. “The spatial analysis of the regional OLR change from 1985–2000 to 2001–2017 shows a ‘clear-sky effect’ mixed a ‘tropical cloud’ effect. Concerning the clear sky effect, we see regional changes of the OLR which are correlated with surface temperature changes. In the Arctic—where the strongest temperature increase occurs—we also see a strong increase in the OLR. In general, in the Northern Hemisphere—where the surface temperature increase is stronger than in the Southern Hemisphere—we also see an OLR increase. The Steven Dewitte and Nicolas Clerbaux paper is mostly silenced, and when it is discussed the outcome is mostly confusion. People seemingly isn`t used to think of ocean circulation as the greatest energy transport on earth, and that discharge of energy at higher latitudes, results in OLR increase. Neither are they used to think that more precipitation over tropics are thinning clouds. This could be destructive for “settled science” as it places some questions about water vapor and cloud feedbacks. The spatial analysis point to the geography of climate change and feedbacks. I have seen one scientist who had his departure in geographical and historical data. Professor Bill Gray left a manuscript when he passed away, on greenhouse warming and climate variability. I think S Dewitte and N Clerbaux confirm some of his ideas, and can show that he had a deeper understanding than most other climate scientists. He attributed much of climate change to the strength of ocean currents and overturning, and to thinning tropical clouds by precipitation. 26 April 2006 Bill Gray was executed at RealClimate. The big guns came foreward. Gavin Schmidt, Michael Mann, Ray Pierrehumbert and Stefan Rahmstorf. with the post: “Gray and Muddy Thinking about Global Warming”. And a discussion strictly controlled by gavin, stefan, raypierre and mike. It would be strange if all Gray`s ideas are right. But I think he made an important contribution, and had a voice worth listening to. D. Hatzidimitriou, I. Vardavas, K. G. Pavlakis, N. Hatzianastassiou, C. Matsoukas and E. Drakakis. Much of the same explanation. Climate change of clouds and wate vapor. How is it possible to think that clouds and water vapor give a positive feedback on longwave radiation equivalent to 3,5 times the CO2 forcing? NK: I tried to post a response about these old papers. It is my impression that these improbably large trends from the pre-CERES era are now presumed to be due to changing and drifting instrumentation. I did a citation search on a widely cited paper Science paper by Weilicki (2002) with large offsetting trends in OLR and SWR similar to the ones you cited. I found the following 2012 paper by Loeb et al with a Figure 1 that aligns all of the data up to 2010 with no overall trend. Without access to an expert, it is difficult to know what surprising observations from the past are still considered valid today after collecting another 15+ years of data, but a citation search is one place to start. On the other hand, Nic Lewis got started by digging into an early paper by Forster showing an ECS lower than most other publications and trying to understand why others obtained a much higher ECS from similar information. Frank, thank you for your thoughts on this. What struck my mind was that a very recent paper had this increase of TOA LW radiation. And that it was analysed for a long period, 1984 to 2016. Steven Dewitte and Nicolas Clerbaux paper is from 2018. For me this was rather astonishing. So I wondered that it wasn`t followed up by other scientists. It goes into the basics of GHG warming, and questions the consensus myth. It looks like cloud and water vapor feedbacks are more than offset by lapse rate feedback. I think that other papers on this subject have too short periods to tell much about trends. And even Steven Dewitte and Nicolas Clerbaux have a period with some natural variation. NK: Thanks for bringing up Dewitte&Clerbaux (2018). When you copied the abstract, you appear to have missed the most important sentences about LWR feedback. The crucial finding is Figure 4, showing dOLR/dTs = -2.93+/-0.6 W/m2/K (95% ci) as determined by observations from space. That would an ECS of about 1.25 K/doubling before including SWR feedback. Figure 4 shows observations from three sources that are superficially consistent with this conclusion. The paper is marked “editorial”, was accepted 4 days after it was received and published 4 days after that. Probably not peer-reviewed. I tried to look up dOLR/dTs for CMIP5 models, but AR5 and two papers it cites show only dOLR/dTs and dOSR/dTs from clear skies and a net CRE for LWR and SWR combined. So I couldn’t do a proper comparison. The author’s citation (#15) is to a 1990! paper on climate models showing an average dOLR/dTs of -2.2 W/m2. Two other comparisons I am aware of are: -2.2 W/m2/K seen in seasonal warming (which overweights the extra-tropics) and -4.0 W/m2/K for the tropics in Mauritsen and Stevens paper on an iris effect. In other words, this isn’t out of line with other estimates for dOLR/dTs made from observations. “We conclude there exists a “longwave cloud thinning effect”: as the earth warms, it contains less clouds, and becomes a more effective radiator. This cloud thinning effect is underestimated in most of the models.” Sound a lot like the iris effect postulated by Mauritsen and Stevens. In their simple model of an iris effect, however, cloud thinning is accompanied by a large positive SWR feedback. Do you have a link for Clerbaux and Dewitt? It looks like you have to go into secret AR5 archives to get data on model dOLR. Gavin A. Schmidt, Reto A. Ruedy, Ron L. Miller, and Andy A. Lacis, 2010. So, if the TOA outgoing LW radiation is increasing over time, with increased CO2, does it mean that 41% of of this is attributed to change in water vapor, 31% attributed to change in clouds, 18% attributed to Change in CO2 and 9% attributed to everything else? The numbers above was from Kiehl and Trenberth, 1997. NK: Schmidt is focused on the pre-industrial GHE. The enhanced GHE appears more important. We are expecting a doubling or tripling of CO2, but water vapor may increase roughly 7%/degC of warming. If you go to the online MODTRAN and increase the water vapor scale from 1.00 to 1.07, OLR drops by about 1 W/m2, except through clear tropical skies where the decrease is 1.6 W/m2. Clouds produce a smaller decrease in OLR and higher cloud have more effect than lower ones. So the decrease in OLR associated with the increased humidity expected for 3K of warming is roughly comparable to the decrease OLR from a doubling of CO2. Modtran doesn’t take into account the negative lapse rate feedback produced by rising humidity, which negates roughly half of the feedback expected from rising water vapor alone. If so, we expect roughly comparable decreases in OLR for a doubling of CO2 and from a 50% increase in humidity due to 6K of warming. I wonder what you think about Held`s finding that most models have an decreased LW perturberation, which means increased OLR, and show a cooling of the atmosphere-ocean system over time, with rising CO2. I read this as a general LW negative feedback, but don`t understand the dynamics behind it. I have got the feeling that it is difficult for the “settled” climate scientist society to acknowledge some iris effect. Dressler, Schmidt and others have invested some prestige to debunk Lindzen, so it seems like an official RealClimate policy to hold back on negative feedbacks. And the followers follow. The genius of our host can be seen in his insistence on understanding the basics. His first post on clouds shows key results from ERBE: cloudy skies emit 18 W/m2 less LWR (cold cloud tops), but reflect 30 W/m2 more SWR. On the average, if cloud fraction goes down with warming, we should expect to see an increase in emission of LWR and a bigger decrease in reflection of SWR. Then SOD shows us maps showing how this average values vary geographically. If LWR feedback in the tropics is far more negative from cloudy skies than clear skies because cloud fraction is going down, then most likely it is going to be associated with strongly positive SWR cloud feedback. When CMIP5 models were forced in AMIP experiments with observed rising SST from 1979-2008, they exhibited an average ECS of 1.5 K due to a low climate feedback parameter 2.3+/-0.7 W/m2/K. It seems to me that the observed warming must have been in regions where is didn’t “punch large holes in clouds”. That heat apparently does “punch holes in clouds” during normal model runs where the AOGCM controls changes in SSTs. Or perhaps the difference is which clouds change. Figure 5.6 shows us which regions have clouds that are (on the average) most and least cooling. In any case, the situation is ridiculously complicated. Thank you Frank. What you say seems very reasonable to me. Why was this so surprising? There had been some sceptical voices to the canonical wiev. Why couldn`t they just say that the scientific consensus on greenhuose warming was a big misunderstanding, and that the canonical view was just plain wrong? 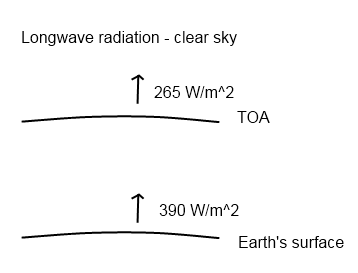 So how big is the contribution from longwave backradiation compared to SW warming? 1%, 10%, 100%?. How much can the “control knob” CO2 manage to control? where dQ is ocean heat uptake. So, the only thing a larger ocean heat uptake does is increase the amount of time it takes to approach steady-state and not steady-state itself. Figure 2B in the paper we were discussing shows the differences in ocean heat uptake between various IPCC models, expressed as the effective depth of the mixed layer that contains all of the heat ocean absorbs over time (assuming a uniform heat accumulation in that mixed layer). That value ranges +/- 25%. We can track transport of heat by physical mixing through two proxies: CFCs and C-14 from atmospheric testing of atomic bombs, but I haven’ found any good comparisons between observations and hindcasts. Equilibrium warming depends only on the climate feedback parameter, not how it is partitioned between its LWR and SWR components. The “canonical view” misses the importance, generality and physics of the climate feedback parameter by discussing its reciprocal K/(W/m2) and converting W/m2 to doublings of CO2 to get ECS. dI/dTs must be negative (or you have a runaway GHE) and the biggest negative term is Planck feedback (-3.3 W/m2/K for a graybody model). If your forcing is from the sun, you certainly expect OLR to increase, despite the fact that the forcing is in the SWR channel. The forcing caused by rising GHGs is no different, except that we have no way to physically measure that forcing. Instead, we fall back on radiative transfer calculations, which require us to specify the temperature and composition of the atmosphere through which radiation is traveling. Thus we do calculations imagining an abrupt doubling of CO2. However, long before CO2 can double, the planet has begun to warm, changing both OLR and ASR. If dASR/dTs were zero, what would we measure at the TOA? For an instantaneous doubling of CO2, we would expect OLR to drop 3.6 W/m2 and gradually return to normal as the planet warms. Now lets suppose dASR/dTs and dOLR/dTs are both equal magnitude and have the same (negative) sign. Balance at the TOA will be restored by a 1.8 W/m2 increase in OLR and a 1.8 W/m2 increase in reflected SWR (technically both values are negative, since they are heat lost by the planet). In this case only half of the drop in OLR (1.8 W/m2) will be recovered by steady state warming; the rest will come from decreasing ASR (1.8 W/m2). Now let’s suppose that dASR/dTs has the opposite sign as dOLR/dTs and half the magnitude. That would mean that for every 2 W/m2 more OLR lost to space by warming, 1 additional W/m2 of ASR would be coming in. To get a NET 3.6 W/m2 out, we need 7.2 W/m2 of increased OLR (technically a negative number) and 3.6 W/m2 more solar radiation will be getting past the clouds. Halfway through this warming process, OLR will have increased 3.6 W/m2 – restoring “balance” in the LWR channel – and ASR will have increased 1.8 W/m2 – making it appear as it ASR is now doing all of the warming. However, this isn’t right, because the planet IS WARMER at this halfway point and would be emitting 1.8 W/m2 more LWR simply because of its higher temperature, and leaving half of the forcing from rising GHGs in place. You cited a press release by MIT. The paper can be found at the link below. Figure 3 shows us how mutually inconsistent climate models are in partitioning the climate feedback parameter into its dOLR/dTs and dASR/dTs components. Figure 3A in the paper shows how much varies AOGCMs disagree with each other about dASR/dTs and dOLR/dTs. The surprise in the figure is the square symbol and dashed circle claiming to be observational estimates for dASR/dTs and dOLR/dTs. These observational estimates are calculated in the Supplementary Material. Those values are derived from CERES data for 2000-13, using the same kind of linear regressions as Dessler (2018) except that OLR and SWR are analyzed separately. dOLR/dTs is -2.0 +/- 0.4 W/m2/K (one STD, r^2 = 0.28) and dOSR/dTs = +0.8 +/- 0.4 W/m2 (r^2 = 5%). Of course, the data from seasonal warming indicates to me that monthly SWR isn’t a simply function of Ts and that some components are lagged, explaining why the r^2 for SWR is so low and invalidating the slope as a measure of SWR feedback. Thank you for an informative answer, Frank. Thoughts to the SW warming: (The energy budget in reality). As 93% of this warming goes into oceans, the behavour of oceans will be the critical point. Most of the warming goes out again in the night. Another part of the energy has a seasonal outlet. Some great cycles have an outlet of some years, as Pacific and Atlantic currents. And still others will have decadal and even millennial cycles, as ocean overturning and water sinking. So how can this energy transport be simulated in models? My guess is that informed guessing comes closer than mathematics. And how do the CO2 level influence this energy transport? And I wonder if changing wind pattern has more impact on energy transport than changing temperatures.